The Commission of Inquiry, constituted by the Supreme Court of India, in Writ Petition (Criminal) 129 of 2012 [Extra Judicial Execution Victims Families’ Association and Another (petitioners) Against Union of India and Others (respondents)] and Writ Petition (Civil) 445 of 2012 [Suresh Singh (petitioner) Against Union of India and Others (respondents)] has filed its report to the Court on 30 March 2012. The investigation by the Commission, chaired by Justice N. Santhosh Hegde (retired Judge to Supreme Court and former Solicitor General of India), having Mr. J. M. Lyngdoh (former Chief Election Commissioner of India) and Dr. Ajai Kumar Singh (former Director General of Police, Karnataka state) as members, has categorically shown the true face of law enforcement in Manipur. The Commission’s report, a summary of which is reproduced below, confirms the ugly reality of impunity behind extra-judicial executions in Manipur. (v) the abysmal failure of the draconian law, the Armed Forces (Special Powers) Act, 1958 (AFSPA), coupled with the perpetual imposition of emergency under Section 144 of the Criminal Procedure Code, 1973, that has perpetuated loss of faith of the people in their government and institutions and has in fact precipitated only more loss of life and violence in the state. The Commission, however, has not dealt with issues like psychological trauma that grips the population, when scores of people have been shot dead often in full public view by the state, constitutionally bound to provide safety and security to every citizen. Though the subject does not fall sensu stricto within the remit of the Commission, per the order from the Supreme Court, it is however a subject that needs to be understood and addressed in detail should there be any discussion regarding the possibility of finding solutions to the problems of the people in Manipur arising out of state-sponsored terror. The report also misses a vital issue, the gender component, i.e. the problems young widows and mothers face when a husband or son is shot dead by the state and accused a terrorist. That the Commission itself is the result of cases filed, including those by young widows in Manipur; it is an issue that warrants close and careful attention. 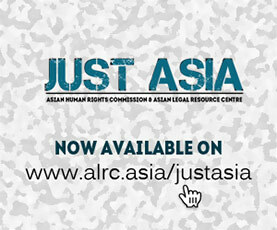 The Asian Human Rights Commission (AHRC) respects the effort of the Supreme Court of India, which has clinically exposed the flaws in state policy with regard to insurgency in Manipur. The AHRC also wishes to express its appreciation of the Justice N. Santhosh Hegde Commission for undertaking the enormous and complicated task of revealing the truth behind ‘executive elimination’ in Manipur. Both cases are pending at the Supreme Court, and it is expected that the Court will deliver its verdict ordering appropriate relief in the case so that Manipur and its people are no more at the mercy of gun-wielding security force officers, who shoot to kill without rhyme or reason, with impunity. The Commission has reported that there is no credible, organised, or satisfactory process through which the security agencies verify the information they receive about a suspect. In this particular case, concerning the murder of Mr. Akoijam Priyobrata, the officer deposed that he would assert that the victim is a member of the KCP since he was found in a place where members of the KCP allegedly reside. This gross absence of reason or intelligence, against a person that the security agencies allege of terrorist affinities, underlines the common knowledge in Manipur that in a very high number of cases, the agencies shoot to kill persons for reasons ranging from mere suspicion to extortion and later label the incident as ‘a terrorist killed in encounter.’ This pattern of accusation of victims of murder finds support at the highest levels of state administration in Manipur, including by its Chief Minister, Mr. Okram Ibobi Singh. Of the cases that the Commission has investigated, not a single case suggests that the murdered victim was, in fact, engaged in terrorist activities. Even high-ranking officers do not have information about the persons executed by their subordinates. In the case of Mr. Elangbam Kiranjith Singh, an officer deposed, “I was not told the name of the person who was to be encountered in the information given by Major Badoni.” What is equally alarming is the fact that ‘encountered’ is a euphemism, used across India and in South Asia generally, for executive elimination. This illuminates the shocking reality that high-ranking officers issue orders to their subordinates to kill persons. Concepts like command responsibility have no meaning in such circumstances when the command itself instigates the crime. Neither the Government of Manipur nor that of the Union have any data concerning the number of civilians killed or injured so far in Manipur in anti-terrorist operations. When the Commission ordered the government to provide such information, the government responded that there is no official record of such information. This suggests deep culpability of both the Union Government and that of the Government of Manipur in shocking events reported from Manipur. Such absence of information further indicates that the government has no policy in place to solve the Manipur crisis even today and is grossly irresponsible with regard to its constitutional mandate. 2. Concerning procedures: The Commission’s findings clearly suggest that the security forces operating in Manipur negate all procedural mandates, including the various directives issued by the Supreme Court of India and the central command of units like the Assam Rifles. The instructions from the Court, first iterated in the D. K. Basu case, and further incorporated into the Criminal Procedure Code, 1973 by way of a substantive amendment, are not observed at all. The Dos and Don’ts, spelt out in the Naga People’s case by the Court and further transcribed as an operational manual by the Assam Rifles, have been violated, in each case investigated by the Commission. In fact, some of the high-ranking officers who deposed before the Commission even expressed complete absence of knowledge on this. In the Naga People’s case, the Court directed that Section 4 of the AFSPA is no carte blanche for the exercise of unlimited power. Considered along with other facts and in interpretation of the law, the ratio decidendi concerning Section 4 was that the power conferred by the section should be used with exceptional caution, and that the security forces must use only the minimum force necessary to undertake the job at hand. Yet, the Commission’s investigation reveals that the officers on the ground do not follow this even as an obiter dictum. Instead what has been revealed is the gruesome fact that the government is extending the operation of Section 144 of the Criminal Procedure Code, 1973, as required under Section 4(a) of the AFSPA, almost perpetually in Manipur. This is complemented with the increase in the number of armed forces stationed in the state and the number of extrajudicial executions and/or other violent incidents in which the state forces are involved. The moot point would be whether this has led to any improvement in the situation in Manipur? With a government that is unable to provide even the number of persons having so far lost their lives in Manipur at the hands of security forces, the rationale, or rather irrationality, of extending the operation of AFSPA and Section 144 of the Criminal Procedure Code in Manipur is more than questionable. Or, as the Commission’s findings strongly suggest, is it the very policy of the state not to have a sensible plan for Manipur to address prevailing issues through dialogue? If this is so, it negates the constitutional legitimacy of the government. The absence of policies and practices, on administrative, procedural, legal, as well as disciplinary oversight that any government concerned about the peace and security of its people and the integrity of its territory should have in place, is further illuminated in the Commission’s report. The Commission further found, in terms of the procedures to be followed under Section 176 of the Criminal Procedure Code, 1973, concerning magisterial enquiry to be conducted in all cases of death in police custody or police action, that enquires are being undertaken after the lapse of couple of years. The Commission’s investigation also found that judicial enquiries take years to be completed. Such exorbitant delay kills the purpose of the enquiry. The Commission further concluded that the absence of any procedural discipline provides substantial opportunities for state agencies to tamper with and/or destroy the scene of crime. The Commission has highlighted the callousness with which the authorities deal with accusations against victims killed in encounter. To prove this, the Commission cited a case that it investigated, where the charge against the deceased was that he was suspected of unlawful activities. However, the charge was made after the execution of the suspect, and the case, according to government records is still under investigation against the deceased. The Commission concludes that the provisions of the Unlawful Activities (Prevention) Act, 1967, are abused in Manipur. Anyone shot dead or anyone authorities wish to investigate is charged under the provisions of this draconian law, without reason. Concerning forensic examinations, the Commission concluded that it is routine practice for such examinations be delayed for days. In not a single case has there been an attempt to undertake a forensic examination of the crime scene. In fact, the state officers who deposed before the Commission were not aware that this is an investigative requirement in each case of extrajudicial execution. In most cases, autopsy examinations are undertaken after long delays. 3. Patterns: In all cases, the Commission found that the state officers did not have any credible, verified, and specific information concerning the identity of the victims. The encounters took place in such fashion that in all cases the security forces have received generic and vague information about a suspect, who, upon being approached by the state agencies, tried to escape and in the process fired at the officers, often one to three shots, using a 9 millimetre pistol, and in retaliation, the officers fired at the suspect thereby killing him. Often, victims were found to have been fired upon from behind, at a close range, sometimes as close as within 2 feet. All victims have suffered multiple gunshot wounds, ranging from half a dozen to 32 gunshot wounds. In none of the cases, has any security force officer, their equipment, or their vehicle suffered injury or damage. In all the cases, the body has been sent to the hospital and a case registered against the victim, often under the Unlawful Activities (Prevention) Act, 1967. In not a single case has an investigation, as to the background of the firing that resulted in the death of a person, been conducted by the agencies. In at least two occasions, independent judicial enquiries have revealed that the story proposed by the state agencies was wrong and concocted. Yet, no officer or agency has been asked to provide explanation and no prosecution has been initiated against the officers involved. In all instances, high-ranking officers participated in the action, often sitting in their vehicle at a distance, not direct witness, with messages relayed to the officer through a constable or other low-ranking officer. Read and understood in detail, these are more than just indications of state-sponsored terror, committed with impunity. It means that Manipur is under the grip of state terror, where executive elimination of citizens is rife. It is a consequential damage, to be expected from such a condition, that the people in the state have become alienated from their government, for which the Union as well as state government must be held answerable. At the very least, the government owes an apology to the people of Manipur for what its agencies have carried out in the name of security. The findings of the Court, reflects the collective conscience of the people of Manipur. The deep trauma caused by extreme forms of violence in Manipur, will run through generations, for India and its people, including those who call Manipur home, will have to pay a price. A government that is honest to its constitutional promise has a heavy responsibility to end this violence now, and answer the questions posed in the report, to the satisfaction of the country. For now, the case before the Supreme Court continues. The complete copy of the Court’s report is available for downloading here.